Swarm-bots is a project sponsored by the Future and Emerging Technologies program of the European Commission (IST-2000-31010), aimed to study new approaches to the design and implementation of self-organizing and self-assembling artifacts. The project, that lasted 42 months, was successfully completed on March 31, 2005. 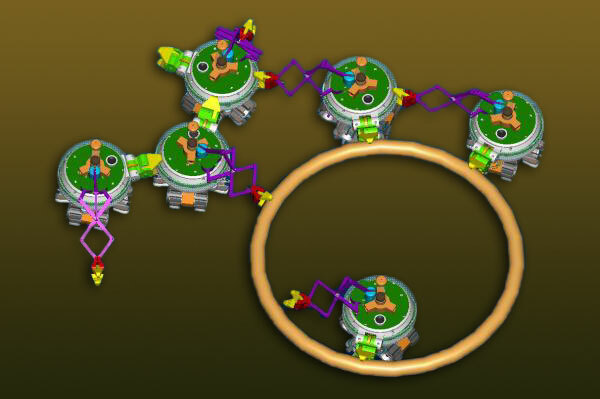 Since October 1, 2006, the Swarmanoid project is extending the work done in the Swarm-bots project to three dimensional environments. Dr. Marco Dorigo, the project coordinator and one of the founders of the swarm intelligence and swarm robotics research fields, has been awarded, in November 2003, the First EU Marie Curie Award, and in November 2005, the prestigious «FNRS Prize - Prix Dr A. De Leeuw-Damry-Bourlart», worth 75,000 EUR, for his contributions to artificial intelligence and robotics. Dr. Francesco Mondada, one of the main designers of the swarm-bot at EPFL, Lausanne, has been awarded, in November 2005, the Swiss Latsis University prize, worth 16,500 EUR, for his contributions to bio-inspired robotics.